All before the opening bell. Hungry to play in the big leagues, Jay West lands a coveted position with a powerful Wall Street investment firm, working as the handpicked protégé of the successful, charismatic Oliver Mason. But Jay soon suspects that Oliver's stellar track record is more than a result of hard work or good luck. The man seems to have everything--including a violent temper and a boundless desire for money and prestige. Then a trusted coworker is brutally murdered. With a conspiracy of deceit and corruption closing around him, Jay races to untangle the sordid lies that have quickly and too conveniently blackened his name. Trusting no one, Jay must rely on his own cunning and wits to stay in the game--and to stay alive. Stephen Frey is a former vice president of corporate finance at a major Manhattan bank and worked in mergers and acquisitions at J. P. Morgan and Co. He is currently a principal at a private equity firm near Washington, D.C. Frey is also the author of the bestsellers The Takeover, The Vulture Fund, The Inner Sanctum, and The Legacy. 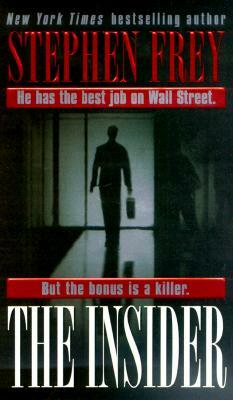 "Grisham meets Ludlum on Wall Street." "Captivating . . . conspiracy and intrigue."